David Hockney was born in 1937 in Bradford, England, and trained at the Royal College of Art in London. He moved to Los Angeles in the early 1960s. 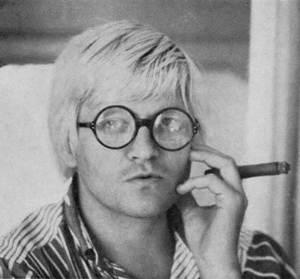 Inspired by the sun, backyard pools, and the California living that he learned about through magazines, Hockney created his own form of Pop Art that reveled in lush surfaces, beautiful bodies, and carefully designed modernist homes. While working in Los Angeles, Hockney began using Liquitex, a new acrylic paint that created an opaque, matte surface and contributed to the iconic quality of his works. In addition to painting, Hockney’s vast body of work includes photographs, photo-collage, and prints.